Rabbit recombinant monoclonal DRP1 antibody [EPR19274]. Validated in WB, IP, IHC, Flow Cyt, ICC/IF and tested in Mouse, Rat, Human. Cited in 11 publication(s). Independently reviewed in 1 review(s). Recombinant fragment within Mouse DRP1 aa 1-350. The exact sequence is proprietary. WB: Human fetal kidney, rat brain, rat heart and mouse brain lysates; A549, U-2 OS, HeLa, Jurkat, HEK-293, HCT 116, PC-12 and NIH/3T3 whole cell lysates. IHC-P: Mouse cerebrum and rat cerebellum tissues. ICC/IF: HeLa and NIH/3T3 cells. Flow Cyt: NIH/3T3 cells. IP: HeLa whole cell lysate. Our Abpromise guarantee covers the use of ab184247 in the following tested applications. WB 1/1000. Detects a band of approximately 83 kDa (predicted molecular weight: 83 kDa). IHC is recommended for rat and mouse only. Functions in mitochondrial and peroxisomal division. Mediates membrane fission through oligomerization into ring-like structures which wrap around the scission site to constict and sever the mitochondrial membrane through a GTP hydrolysis-dependent mechanism. Required for normal brain development. Facilitates developmentally-regulated apoptosis during neural tube development. Required for a normal rate of cytochrome c release and caspase activation during apoptosis. Also required for mitochondrial fission during mitosis. May be involved in vesicle transport. Isoform 1 and isoform 4 inhibit peroxisomal division when overexpressed. Ubiquitously expressed with highest levels found in skeletal muscles, heart, kidney and brain. Isoform 1 is brain-specific. Isoform 2 and isoform 3 are predominantly expressed in testis and skeletal muscles respectively. Isoform 4 is weakly expressed in brain, heart and kidney. Isoform 5 is dominantly expressed in liver, heart and kidney. Isoform 6 is expressed in neurons. Note=May be associated with Alzheimer disease through beta-amyloid-induced increased S-nitrosylation of DNM1L, which triggers, directly or indirectly, excessive mitochondrial fission, synaptic loss and neuronal damage. The GED domain folds back to interact, in cis, with the GTP-binding domain and middle domain, and interacts, in trans, with the GED domains of other DNM1L molecules, and is thus critical for activating GTPase activity and for DNM1L dimerization. Phosphorylation/dephosphorylation events on two sites near the GED domain regulate mitochondrial fission. Phosphorylation on Ser-637 inhibits mitochondrial fissin probably through preventing intramolecular interaction. Dephosphorylated on this site by PPP3CA which promotes mitochondrial fission. Phosphorylation on Ser-616 also promotes mitochondrial fission. Sumoylated on various lysine residues within the B domain. Desumoylated by SENP5 during G2/M transition of mitosis. Appears to be linked to its catalytic activity. S-nitrosylation increases DNM1L dimerization, mitochondrial fission and causes neuronal damage. Ubiquitination by MARCH5 affects mitochondrial morphology. Cytoplasm > cytosol. Golgi apparatus. Endomembrane system. Mainly cytosolic. Translocated to the mitochondrial membrane through interaction with FIS1. Colocalized with MARCH5 at mitochondrial membrane. Localizes to mitochondria at sites of division. Associated with peroxisomal membranes, partly recruited there by PEX11B. May also be associated with endoplasmic reticulum tubules and cytoplasmic vesicles and found to be perinuclear. In some cell types, localizes to the Golgi complex. Exposure time: Lane 1 and 2: 3 minutes; Lane 3: 30 seconds; Lane 4,5 and 6: 8 seconds. DRP1 can be SUMOylated, as described in the literature (PMID: 19638400). Immunofluorescent analysis of 4% paraformaldehyde-fixed, 0.1% Triton X-100 permeabilized HeLa (Human epithelial cell line from cervix adenocarcinoma) cells labeling DRP1 with ab184247 at 1/250 dilution, followed by Goat anti-Rabbit IgG (Alexa Fluor® 488) (ab150077) secondary antibody at 1/1000 dilution (green). Confocal image showing cytoplasm staining on HeLa cell line. The nuclear counter stain is DAPI (blue). Tubulin is detected with Anti-alpha Tubulin antibody [EPR19274] - Loading Control (ab7291) at 1/1000 dilution and Goat Anti-Mouse IgG H&L (Alexa Fluor® 594) preadsorbed (ab150120) at 1/1000 dilution (red). -ve control 1: ab184247 at 1/250 dilution followed by ab150120 at 1/1000 dilution. Flow cytometric analysis of 4% paraformaldehyde-fixed NIH/3T3 (Mouse embryonic fibroblast cell line) cells labeling DRP1 with ab184247 at 1/70 dilution (red) compared with a Rabbit IgG,monoclonal -Isotype Control (ab172730; black) and an unlabelled control (cells without incubation with primary antibody and secondary antibody; blue). Goat anti rabbit IgG (FITC) at 1/500 dilution was used as the secondary antibody. Lane 1: 2 seconds; Lane 2: 8 seconds; Lane 3: 3 seconds. Immunohistochemical analysis of paraffin-embedded Mouse cerebrum tissue labeling DRP1 with ab184247 at 1/1000 dilution, followed by Goat Anti-Rabbit IgG H&L (HRP) (ab97051) at 1/500 dilution. Cytoplasm staining on mouse cerebrum is observed. Counter stained with Hematoxylin. Immunohistochemical analysis of paraffin-embedded Rat cerebellum tissue labeling DRP1 with ab184247 at 1/1000 dilution, followed by Goat Anti-Rabbit IgG H&L (HRP) (ab97051) at 1/500 dilution. Cytoplasm staining on rat cerebellum is observed. Counter stained with Hematoxylin. Immunofluorescent analysis of 4% paraformaldehyde-fixed, 0.1% Triton X-100 permeabilized NIH/3T3 (Mouse embryonic fibroblast cell line) cells labeling DRP1 with ab184247 at 1/250 dilution, followed by Goat Anti-Rabbit IgG (Alexa Fluor® 488) (ab150077) secondary antibody at 1/1000 dilution (green). Confocal image showing cytoplasm staining on NIH/3T3 cell line. The nuclear counter stain is DAPI (blue). DRP1 was immunoprecipitated from 1mg of HeLa (Human epithelial cell line from cervix adenocarcinoma) whole cell lysate with ab184247 at 1/30 dilution. 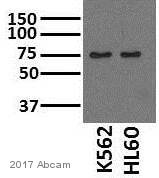 Western blot was performed from the immunoprecipitate using ab184247 at 1/1000 dilution. VeriBlot for IP secondary antibody (HRP) (ab131366), was used as secondary antibody at 1/10000 dilution. Lane 2: ab184247 IP in HeLa whole cell lysate. Lane 3: Rabbit IgG,monoclonal [EPR19274]-Isotype Control (ab172730) instead of ab184247 in HeLa whole cell lysate. Note: DRP1 can be SUMOylated, as described in the literature (PMID: 19638400). Publishing research using ab184247? Please let us know so that we can cite the reference in this datasheet.